We really enjoy Copenhagen. Plenty of people will say it's not as great as Amsterdam, why not Bruges, really we should go to Hamburg, and Montenegro is charming. He likes to tell people it's where my "hair person" is. I don't have a "hair person" but last time I went a woman kindly took me with no appointment, and since I was going back I asked if she had room, and she made room. OK, she opened on a Saturday. For me. So I guess I kind of have a "hair person." She gave us a recommendation for dinner, a son-in-law or someone has an assortment of restaurants, so we went to Pluto. The dishes were small, expensive, but tasty. We followed dinner with a wafflen dessert in Nyhavn, because why not? Museums are closed on Mondays (and sometimes Tuesdays), so for Sunday we checked out the Genetically Altered Little Mermaid, and then the Hirschsprung Museum. The Danish and Dutch artists are phenomenal. We would have liked to go to the modern art museum Louisiana, but not enough time this trip as it's out of town. For our evening entertainment, we arranged to do an escape room. TimeQuest is right off Nyhavn and has a linear room for 2-people. That's a little unusual and we jumped on it. When we finished we had the fastest time, and with no given clues. It's a perfect First Escape Room. That night we went to a place called Tight. The dishes were bigger, less expensive, and just as tasty. Unfortunately, but not unexpectedly, we were seated next to a table of young 20-somethings (one was Scottish, one was Swedish, I think the last was English) who had profound questions to ask of each other - a lot of meaning of life stuff - and all the answers to those profound questions. They were also kind of loud. Monday was a day by train north to Helsingor, the home of Hamlet's Elsinore Castle, correctly known as Kronborg Castle. Right next to the castle is the Maritime Museum constructed inside a ship dry dock. No time for that on this trip! We checked out the castle, took the tour through the Casemates, and rode the ferry across to Sweden's Helsingborg for lunch. Because you do that kind of thing. We stopped in to Redimat (apparently this was the trip for single word restaurants). Redimat serves three meals at lunch time. As it was described to us - a salted meat, a fish, vegetables. Ian's salted meat was an amazing ham steak, my fish was either a halibut or a flounder, and both were complete meals with salad, dessert, and coffee. Highly recommended. We still searched for a Starbucks after, to no avail. Back in Helsingore, we made it in time for our second escape room. 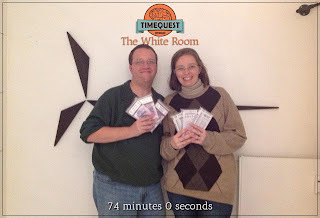 This time we tried a 3-4 person room with a 75-minute time limit. We just squeaked under, but feel pretty strongly that we would have finished faster if one of the puzzles had moved easier (the pieces stuck instead of slid), one light wasn't burned out in the dark room, and another puzzle had all it's pieces (one was missing). Excuses? Perhaps. But hey, we did get out, even with a handful of clues. It was a lovely weekend with Ian, just the two of us wandering around a slice of Denmark, having some fun and eating good food. 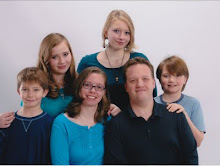 He had to stay the rest of the week for work, and I went home and prepared for a quick trip to the States. I do enjoy that time away with just him.